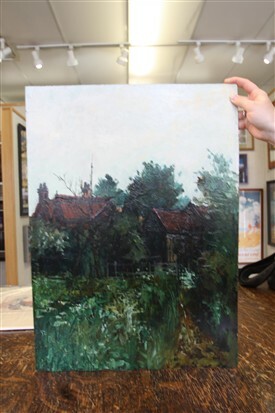 Discovered in the USA: Peter Brannan - "The Old Mill House"
Can You Help Identify this Painting? Inscription on a paper attached to the back of a painting found in a resale shop in Oak Park, Illinois:"The Old Mill House, Attributed to Peter Brannan. 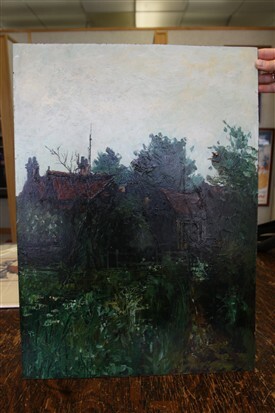 Brannan is a 20th century English painter who is thought to still be living. He was born in 1926 and had a distinguished career in art, and was elected to the Society of British Artists. He is listed in Water's Dictionary which does not state whether he was still living at the time of publication (about five years ago). The old frame for this painting bore an inscription stating that he was the painter. 23 1/2 x 17. In a new frame." The painting is oil on royal board. Editor's Note: Susan Ryan lives in Chicago and is interested in finding out as much as possible about this painting. Is it definitely by Peter Brannan? Is there any trace of it being exhibited or sold in the UK? 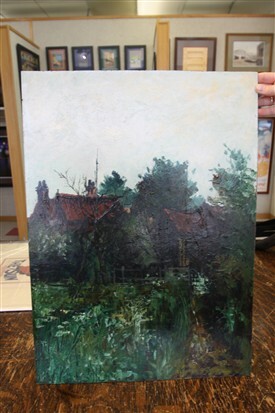 Where is 'The Old Mill House' depicted in the painting? How did the painting work its way over to the USA? This page was added by Susan Ryan on 12/04/2013. Thanks for the pictures Susan! I will alert the curator of our Town Hall Museum, Patty Temple, to this page. She is an expert on Brannan, as the Museum has several of his works, and is holding an exhibition for a month, from 24th April in the Spotlight Gallery, Newark Town Hall. There is also an exhibition of his little-known work with Newark Drama group, designing sets and costumes. Peter taught art and lived in Newark for a good number of years. Thanks for your assistance Jill! The photos of the painting are shown out of the frame because I am having having the painting cleaned professionally. When I have the painting back in its frame, I will post a new picture. Wish I could see the exhibition. When I saw my painting in the shop I knew it was something special. Have you had the picture cleaned yet? Would be really keen to see it in its natural state. We are pretty sure that this IS a Brannan! The painting of Newark Market Place sounds very interesting. According to my notes, Peter Brannan painted several pictures of market places, some of them named specifically as Newark Market. One of them, painted in 1959, is currently on loan to the Newark Museum; another, sold at auction in September 2015, is a later work, signed and dated 1975. A painting titled "Market Square" was shown at Brannan's First One-Man Exhibition at the Trafford Gallery in Mayfair, London, as Exhibit 9, in 1960; whilst a work with the same title appeared in the LAS Autumn Exhibition at the Usher Gallery, Lincoln, in 1970, as Exhibit 29. The latter is listed in the catalogue as Not for Sale and may well be the Trafford Gallery painting on loan from a private collection at the time. 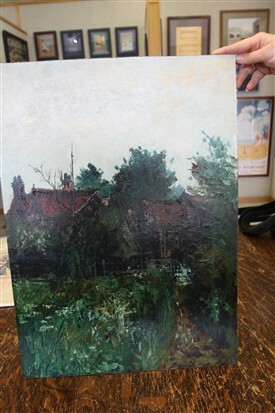 Is the Newark Market Place picture signed and dated; and is there any evidence of provenance on the verso - numbers, artist's label, frame maker and so on? Thank you for highlighting the work's existence! Peter Brannan was my uncle. He is no longer living. I am sure it is by him, and suspect that the subject is in Welbourn, Lincolnshire. Goldmark Gallery in Uppingham, Rutland has information about him, and Malcolm Moyes has published a book about his work. Good to see his work is still of interest!